An integral member of the NYC blade community, Malik Ashby sits down with us for our latest blade check. I’m skating the 2018 61mm USD aeon black and white boot with USD carbon 4 cuffs and reflective paint coated grey Richie Eisler straps instead of buckles. Stock wheels on and one moonshine anti- rocker while riding tri-rocker. Wheels easily. Skating from spot to spot in NYC will destroy your wheels due to the terrible design of our streets and side walks. Straps. Most of my straps lose Velcro strength after six months or so. Axles, wheels or losing a cuff bolt. Wheels, Allen wrenches and xylitol based gum. I have some brand new Enin Straps that I never used, so when my current pair dies I’ll swap for those. 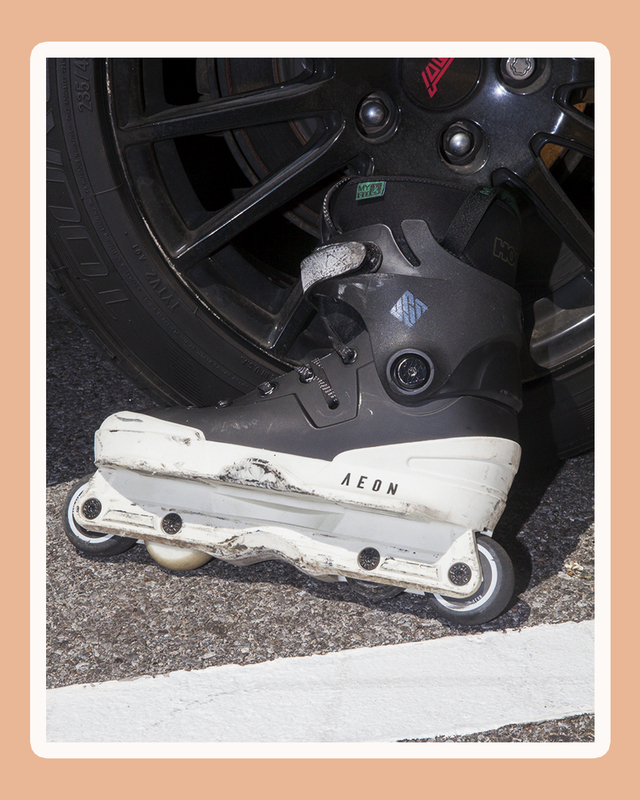 I generally skate the Aeon boot tri-rocker for maneuverability whilst reducing back wheel bite from lazy grinds. I don’t need to skate flat for speed because I’m a runner by profession and I squat 400lbs three times a week so my legs and speed are up to par, haha. Aeon anti rocker setup was recommended for me to try by bl8got him self Richie Eisler in a short convo we had, so that’s my grinder blading preference for summer 2k18. As for full speed skating and fun I have a wizard blading setup on a pair of USD carbon 4’s.